Brickhouse Environmental obtained an Act 2 Release of Cleanup Liability for soil and groundwater after remediating a heating oil spill in the home’s basement. 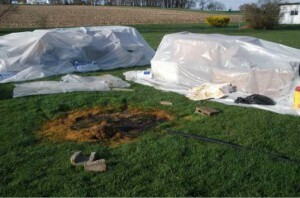 A clogged vent pipe caused an aboveground storage tank (AST) to rupture during a routine fuel oil delivery, releasing heating oil to the basement floor. The oil flowed into a floor drain connected to a basement sump that pumped the oil to the backyard. Brickhouse was contracted by the fuel oil company’s insurance provider after the initial emergency response actions were implemented. Since the homeowner and the oil company did not agree about the necessary cleanup measures, Brickhouse met with PADEP case managers to come to agreement with respect to the scope of work from a technical perspective. Site characterization included a geophysical survey, installation of soil borings and temporary well points, soil demonstration of attainment sampling, installation of four groundwater monitoring wells, receptor survey, and quarterly groundwater attainment sampling. Soil impacts were limited in extent to the area of the sump pump discharge, which were excavated and removed for disposal. Groundwater impacts were also limited in extent and did not exceed the residential Statewide Health Standards at the downgradient property boundary. The onsite water supply well was sampled, and was not impacted by the spill. In addition, vapor intrusion modeling was conducted to confirm the trace levels of heating oil constituents in soil would not impact indoor air quality. 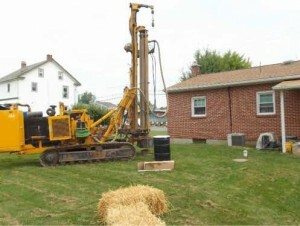 Brickhouse prepared Final Act 2 reports for Soil and Groundwater demonstrating attainment of the residential Statewide Health Standard, which were subsequently approved by the PADEP in 2013 and 2014.